It's time to break one of my golden rules. 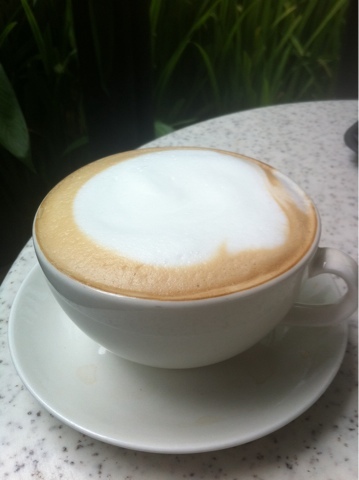 Every cafe - even the best - can have an off day, which is why I don't write blog posts after only one visit. Each post is the result of any number of Saturday mornings staring into the remains of an espresso shot, struggling to think up yet another variation of either "decent third wave indie roaster doing all the right things with espresso" or "sorry, taste buds, I didn't know they were going to do that to you". However, some shots are beyond repair. Occasionally, I come across something that's just fundamentally wrong, and scurry away wondering how anyone could inflict such suffering on innocent coffee beans. 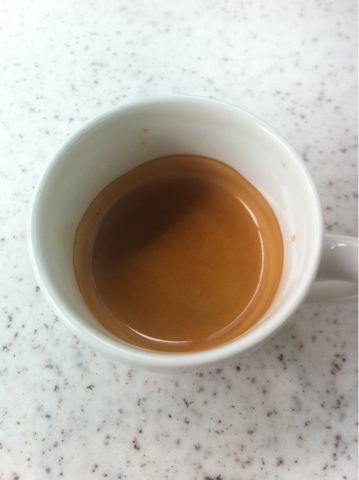 Take a look at the espresso below. 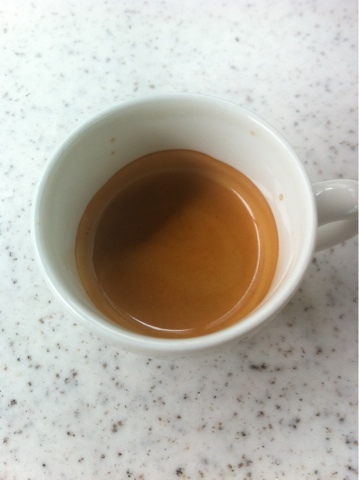 It looks fine - there's a medium dark brown crema - so at least the beans were roasted fairly recently. The volume was a little higher than it should have been for a single shot, but not hugely so. It's an over extracted shot, which can accentuate harsh or burnt flavours (source: coffeegeek.com/opinions/markprince/07-20-2004). Looks can be deceiving though, and tell you little about how the shot actually tasted. This was awful. There was an overwhelming burnt taste that drowned out any hint of complexity or nuance. Burnt is not a flavour, it's a mistake. Anything remotely interesting in the beans was incinerated, leaving something that is the antithesis of quality shots such as Jimmy Monkey's Ironbark, where different beans are brought together to produce a complex, well crafted blend. Whenever I taste a shot, I usually have a rough idea of the where the beans came from - however with the shot above I had absolutely none. Incinerating, rather than roasting, has that effect. The barista that I spoke to had no idea of the origin of the beans used, or if they were using a single origin, or a combination of beans from different regions. I don't expect everyone to have a detailed knowledge of coffee, but know something about what you're selling. I would like to have known if this was a blended variety consisting of predominantly robusta beans, in which case incinerating the beans would be a deliberate choice, an attempt to remove or offset their bitterness. An over extracted shot using beans which have been nuked, rather than roasted, is not quite the foundation for a decent anything, let alone a decent cappuccino. 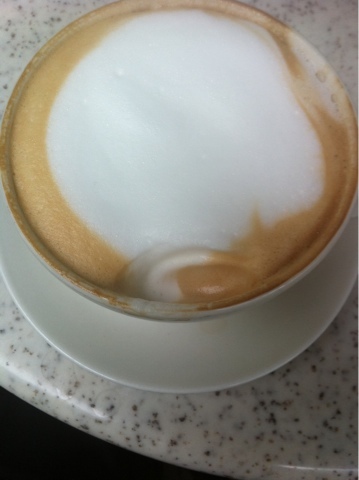 The layer of foam was far too thick, it took two mouthfuls of the stuff before I could even taste coffee. It's the opposite of the latte in disguise problem that I've mentioned in earlier posts, and is an issue in it's own right. It was quite thick also, and rather than the smooth mouthfeel associated with microbubbles, it was strangely reminiscent of marshmallow, as it did not mix with the liquid portion. Unfortunately, the burnt flavour was still very evident through the milk. Because the underlying shot was over extracted, the burnt flavour still managed to dominate what was a single shot drink diluted heavily with milk. The ratio of foam to milk to coffee is worth noting also. There was a large dollop of foam that remained in the mug after I was finished, which makes me wonder if the excessive amount of foam was added for cosmetic purposes - someone's idea of what coffee should look like. If so, it's coffee as candy, stripped of it's character and focus grouped beyond recognition. It genuinely frustrates me that anyone would try a shot like the one above, and conclude that espresso shots are supposed to taste burnt. If you were served a steak in a restaurant that had been burnt to a cinder, you would send it back without hesitation. The same sentiment should apply to coffee - it should not be ok to absolutely ruin what can be a wonderfully complex and interesting drink, and to charge a significant mark up for the privilege. Also, it doesn't have to be like this - approximately 10 meters away, a cafe / bar / restaurant was serving coffee from Papa Palheta, one of my favourite roasteries in any city, or any country. I've said this before, but it bears repeating - it's basically the whole blog summed up in one sentence - don't waste good money on bad coffee. There are so many independent roasteries and cafes producing complex and well crafted blends - Nylon in Singapore, Barista Jam in Hong Kong and Third Floor Espresso in my home town, Dublin, who are so much more deserving of your support.